In today’s DIY world more and more people are finding out how easy it is to refinish an old piece of furniture or other wooden project. Not only have DIY projects become easy, milk paint finishes help you create a masterpiece. Many years ago there was no confusion about wood finishing products because there were few products on the market. Boiled linseed was very popular back in the 70’s and 80’s but people still added oils to it in order to make it more durable. Today’s DIY world of finishes can be overwhelming but when it comes to quality and environmentally-safe choices, natural milk paint finishes are clearly the answer. Let’s take a look at some milk paint finishes you can choose for your upcoming painting projects. From the tung tree comes pure tung oil (also known as China wood oil). 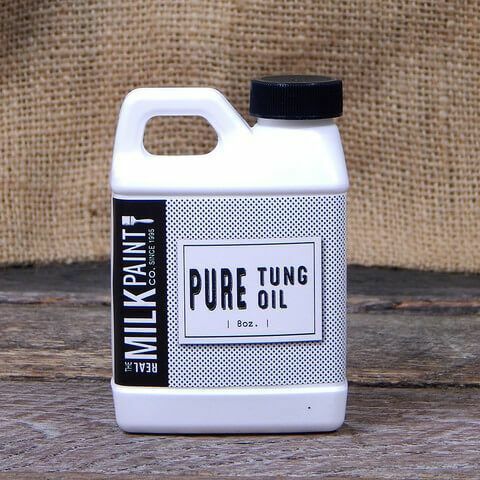 Milk paint finish projects need to be finished with environmentally safe oils – this means no petroleum distillates or other additives. Tung oil is a great option for projects in which you do not want a glossy finish. This oil resists abrasions and acids, it does not blister or peel, it does not mold, and it has a long shelf life. Tung oil is incredible because elasticity is an important factor, as the oil must continue to flex with the expansion and contraction of the substrate on which it is applied. This product is virtually the same as the pure tung oil with one exception – there is a non-toxic, naturally occurring resinous hydrocarbon added for color. This resin does not contain any PCB’s and it is non-carcinogenic. Dark raw tung oil resists marring and it penetrates into wood surfaces. It cures by oxidation not evaporation giving you better results with your natural milk paint projects. 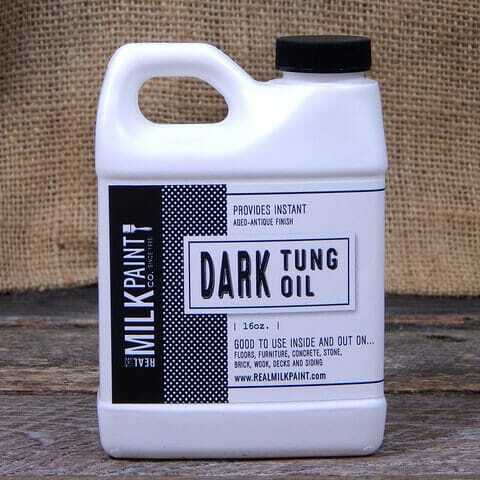 Dark raw tung oil forms a flexible waterproof finish and it resists abrasions. Like pure tung oil, this oil does not form a glossy coat. When you are working on projects like table tops, cutting boards and other wooden kitchen items you need a food safe oil and the “Half & Half” is the obvious choice. Half pure tung oil and half citrus solvent are also good for other surfaces such as porous stone, concrete floors, and more. After application, the scent of oranges may be with you up to two weeks – and it is safe. 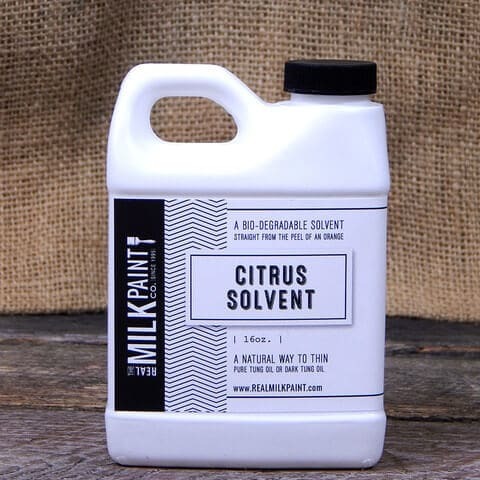 Natural citrus solvent is a replacement for mineral spirits. This environmentally safe product is used wherever paint thinner or mineral spirits are required. It is an excellent degreaser, paint thinner alternative, and can be used to replace petroleum chemicals such as mineral spirits. This incredible product is 2% water and 98% pure citrus peel oil extracted from orange peels. Hemp oil is a favorite among the DIY crowd and those with milk paint finish jobs love the nutty aroma that this oil leaves. Hemp oil dries to a matte finish, it can be used on bare floors, chalk paint, and it gives life to old wood finishes. Hemp oil has a thin viscosity and penetrates well on porous surfaces. Natural milk paint finishes makes sense. In today’s world we need to avoid toxins at all costs and not only are natural milk paint finishes environmentally safe; your DIY project will become a fabulous work of art.